Print played an important role in early American culture almost from the start. Its importance grew throughout the eighteenth century as the number of printers, printed matter, and readers also increased. Print facilitated political and religious debates but it also played a crucial role in the burgeoning colonial and Atlantic economies by transmitting commercially valuable information and providing advertising outlets for domestic merchants and shopkeepers. “Print culture” is a term that encompasses not only printed matter as texts but includes the people involved in the production, distribution, and reception of print and the networks they created to facilitate those processes. 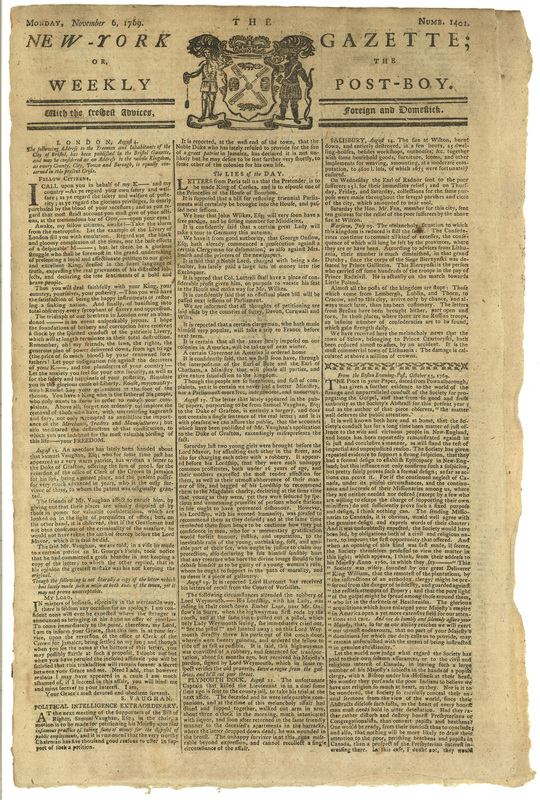 By thinking of the people, networks, and processes involved in creating, circulating, and consuming printed matter, the concept of “print culture” allows us to see the connections and importance of print to individuals, groups, communities, and, most importantly, to early American society as a whole. What role did print play in colonial society? What forms of print were available in the eighteenth century? How important was print, especially newspapers, in colonial resistance to the British empire? How did print contribute to the war? How did print culture change in the early republic? Jonathan Wilson received his PhD in History from Syracuse University. His dissertation on focused on articulations of national identity in early-republican and antebellum New York City through the so-called Knickerbocker circle and the writers of Freedom’s Journal. Adelman, Joseph M. “‘A Constitutional Conveyance of Intelligence, Public and Private’: The Post Office, the Business of Printing, and the American Revolution.” Enterprise & Society 11, no. 4 (2010): 709–752. Amory, Hugh, and David D. Hall, eds. A History of the Book in America: Volume 1: the Colonial Book in the Atlantic World. Chapel Hill: University of North Carolina Press, 2010. Bailyn, Bernard, and John B. Hench, eds. The Press and the American Revolution. Worcester: American Antiquarian Society, 1980. Bond, Gordon. James Parker: A Printer on the Eve of Revolution. Union: Garden State Legacy, 2010. Botein, Stephen. “‘Meer Mechanics’ and an Open Press: the Business and Political Strategies of Colonial American Printers.” Perspectives in American History 9 (1975): 126–225. Brooke, John L. “To Be ‘Read by the Whole People’: Press, Party, and Public Sphere in the United States, 1789-1840.” Proceedings of the American Antiquarian Society 110, no. 1 (2000): 41–118. Brown, Richard D. Knowledge Is Power: the Diffusion of Information in Early America, 1700-1865. New York: Oxford University Press, 1991. Clark, Charles E. The Public Prints: the Newspaper in Anglo-American Culture, 1665-1740. New York: Oxford University Press, 1994. Copeland, David A. Debating the Issues in Colonial Newspapers: Primary Documents on Events of the Period. Westport: Greenwood Press, 2000. Eaton, Joseph. The Anglo-American Paper War: Debates about the New Republic, 1800-1825. New York: Palgrave Macmillan, 2012. Ferguson, Robert A. Reading the Early Republic. Cambridge: Harvard University Press, 2006. Gardner, Jared. The Rise and Fall of Early American Magazine Culture. Urbana: University of Illinois Press, 2012. Gross, Robert A. and Mary E. Kelley, eds., A History of the Book in America, Volume 2: An Extensive Republic: Print, Culture, and Society in the New Nation, 1790-1840 (Chapel Hill: University of North Carolina Press, 2010). Hall, David D. Cultures of Print: Essays in the History of the Book. Amherst: University of Massachusetts Press, 1996. Hruschka, John. How Books Came to America: The Rise of the American Book Trade. State College: Penn State University Press, 2012. Kelley, Mary. Learning to Stand & Speak: Women, Education, and Public Life in America’s Republic. Chapel Hill: University of North Carolina Press, 2006. Loughran, Trish. The Republic in Print: Print Culture in the Age of U.S. Nation Building, 1770-1870. New York: Columbia University Press, 2007. Pasley, Jeffrey L. “The Tyranny of Printers”: Newspaper Politics in the Early American Republic. Charlottesville: University of Virginia Press, 2002. Rice, Grantland S. The Transformation of Authorship in America. Chicago: University Of Chicago Press, 1997. Richardson, Lyon N. A History of Early American Magazines 1741-1789. New York: Thomas Nelson and Sons, 1931. Slauter, Eric. “Reading and Radicalization: Print, Politics, and the American Revolution.” Early American Studies: An Interdisciplinary Journal 8, no. 1 (2010): 5–40. Thomas, Isaiah. The History of Printing in America, 2 vols. Albany: Burt Franklin, 1874. Waldstreicher, David. “Reading the Runaways: Self-Fashioning, Print Culture, and Confidence in Slavery in the Eighteenth-Century Mid-Atlantic.” The William and Mary Quarterly, Third Series 56, no. 2 (1999): 243–272. Warner, Michael. The Letters of the Republic: Publication and the Public Sphere in Eighteenth-Century America. Cambridge, Mass: Harvard University Press, 1990. Warner, William Beatty. “Communicating Liberty: The Newspapers of the British Empire as a Matrix for the American Revolution.” ELH 72, no. 2 (2005): 339–361. Wrightson, Nick. “‘[Those with] Great Abilities Have Not Always the Best Information’: How Franklin’s Transatlantic Book-Trade and Scientific Networks Interacted, Ca. 1730–1757.” Early American Studies: An Interdisciplinary Journal 8, no. 1 (2009): 94–119. Wroth, Lawrence C. The Colonial Printer. 2nd ed. Charlottesville: University of Virginia Press, 1964.